The effects for this movie were originally being done at Richard Edlund's Boss films and nearly five months of miniature submarine construction was undertaken under the supervision of Greg Jein. The original methodology was to shoot all the models mounted on model movers with motion control and matte them into backgrounds shot separately. 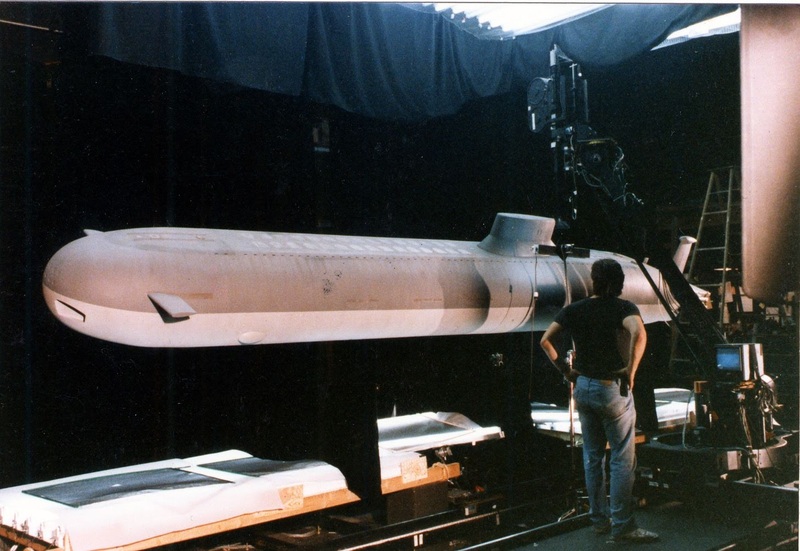 At some point during the testing phase, there was a falling out between the production and the visual effects facility over the look of the test shots and the entire project and the existing models were moved to ILM leaving them around three months to complete the 50 or so effects shots required to complete the movie. 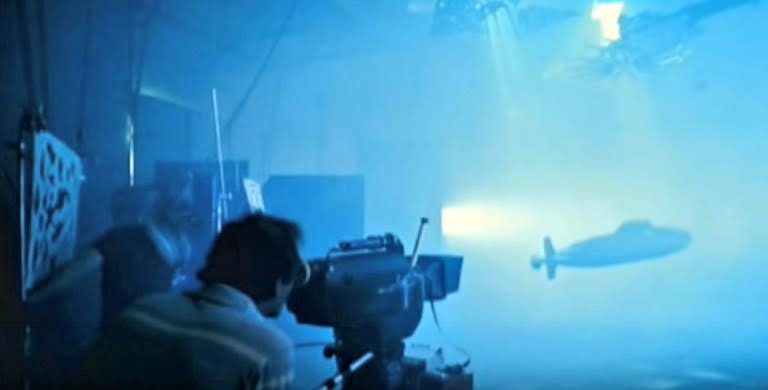 At ILM, due to the short deadline, it was decided to similarly shoot the models using motion control but for the most part in a smoke environment thus capturing the background at the same time. This was done to limit the amount of optical compositing that would otherwise be needed. 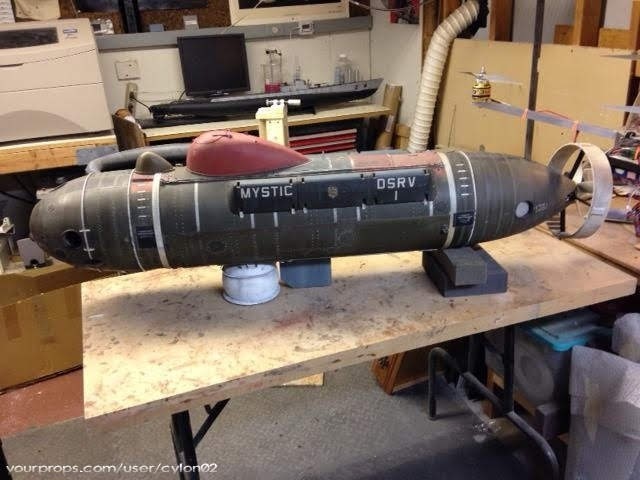 The miniature submarine line up consisted of a 21 ft (6.4 m) and a 4 ft (1.2m) Red October model, a 9ft (2.7m) Kronolov sub, two 10ft (3m) dallas subs, a 2ft (0.6m) rescue submersible and a 6 ft (1.8m) torpedo. ILM then added an inbetween sized 11ft (3.3m) Red October, a bottom section of a 21ft Red October for some new shots that had been added and a 2ft (0,6m) torpedo. 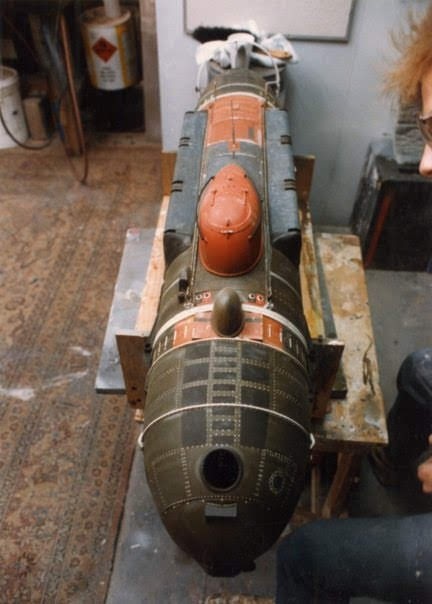 Most of the time the larger red October model was mounted on a rigid pylon which allowed for motorised pitch and yaw action and was framed out of shot. 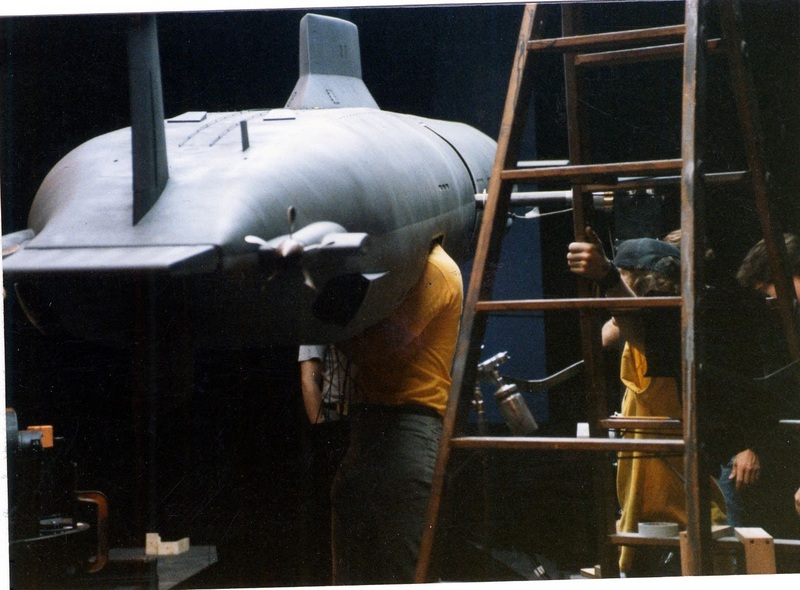 The other models in shot were generally hung from a wire rig, developed by Tad Krzanowski originally for Batteries not included and also used for some of the submersible shots in the Abyss. This consisted of a 12 wires running down to one of 4 points on the model, 3 wires to each of the 4 mount points. 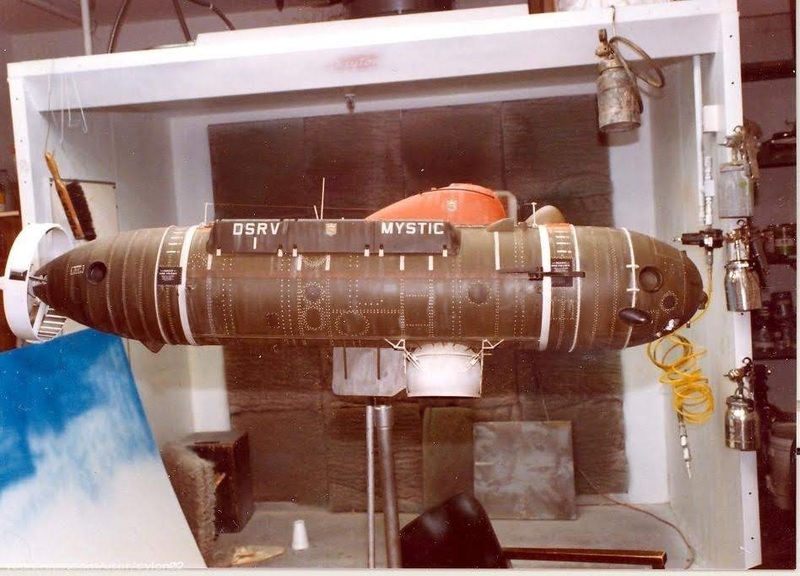 The wires were controlled by something like the swash plate of a helicopter and allowed for yaw and pitch motion of the model. The 3 wires to each point plus gravity, effectively created a cross braced support and a relatively rigid structure. 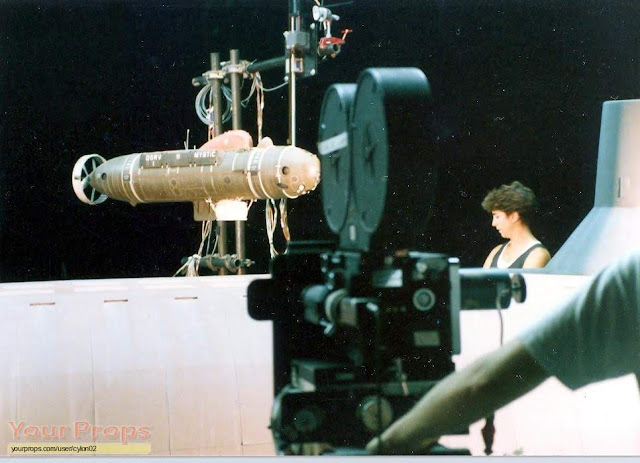 The models were hung from this rig which was mounted on a camera crane arm adapted for motion control that ran on a track that was atop a 25 foot (7.6m) long scaffold structure 12 ft high (3.6m). 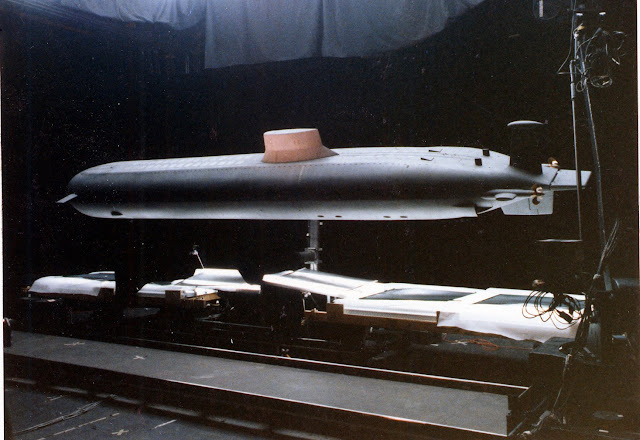 For a few shots the 250 pound (113kg) Red October model was also hung from this rig. The other relatively light weight models averaged 40 -45 pounds (18-20kg). A smaller 16ft long motion control track and crane was mounted on a mobile scaffold that could be re-positioned relatively easily. 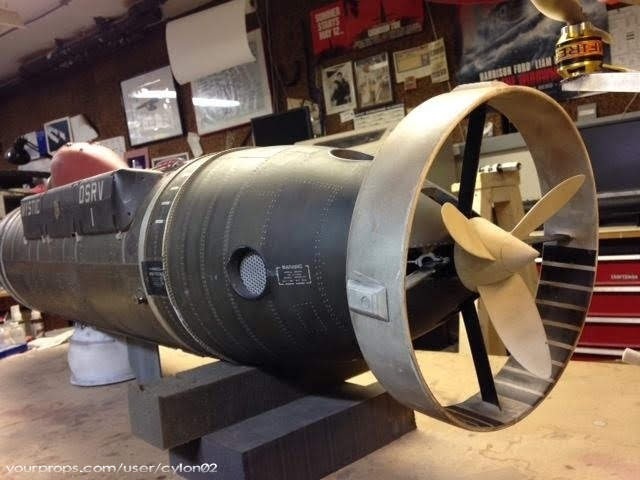 This was mostly used when a second submarine needed to be seen maneuvering in the background. One of the tricks to getting the smoke to look like it was deep underwater was to light a curtain of smoke in the background. These lights were on dimmers and as the subs moved through the space the background lights would be slowly faded up and then down as they entered and left the frame. Without this the background density would be too bright. The lighting also had to be very soft and indirect as obvious delineated shafts of light would not be correct for the deep ocean. Each shot was a very difficult and time consuming choreography of moving models, camera and dimming lights. The camera framing had to ensure that all the lights and support rigs were out of frame or at least hidden in the smoky gloom. This meant that the output was around 1 shot per day. 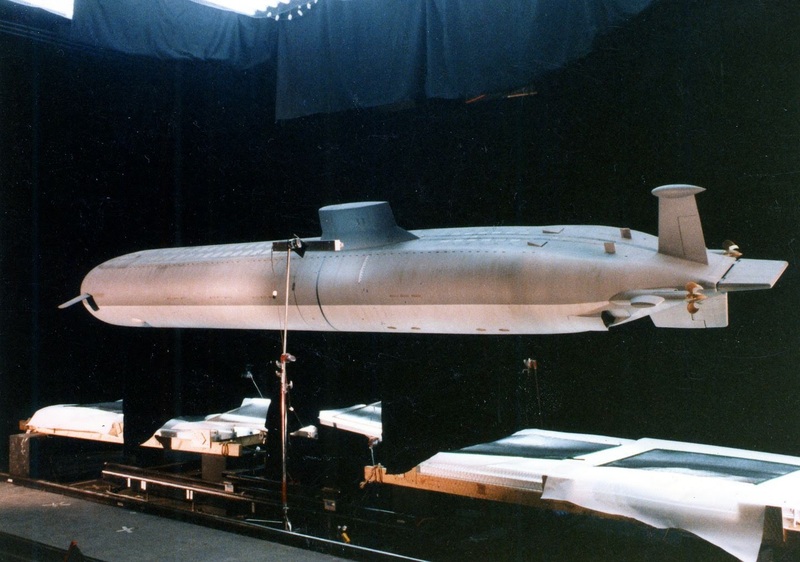 In order to achieve the really close passes on the model mirrors were used in a periscope like arrangement, where the bulky Vistavision camera body would have grazed the hull. Various grades of Super frost filters were used on the lenses to enhance the murky underwater effect. The smoke was generated using a cracker system which is a method of atomising mineral oil using compressed air. A sensor would turn on and off the smoke automatically to maintain the right density. About 40 miniature rock spires were built to represent an underwater trench. These ranged from 3 ft (1m) to 22 ft (6.7m) high and could be arranged in various formations to suit each shot in the sequence. 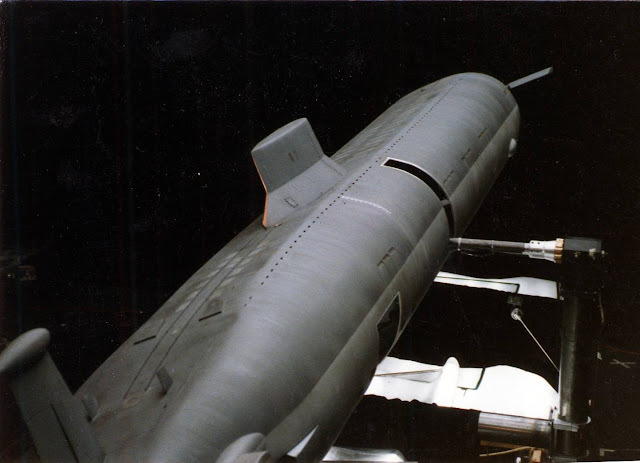 The miniature work in the film and the simulation of the underwater environment is pretty convincing however in a few shots, the optical compositing, particularly the shots concerned with the counter measures and the torpedo trail, is less successful. One other miniature of note is the Russian Bear bomber aircraft, seen in one really quick shot flying over the ocean. It looks to me as if it is supported at its tail which is just out of shot, and filmed against a real sky and ocean, possibly from the deck of a boat or a truck driving along a coast road. However the shot was achieved, the highly detailed and reflective model is very effective.